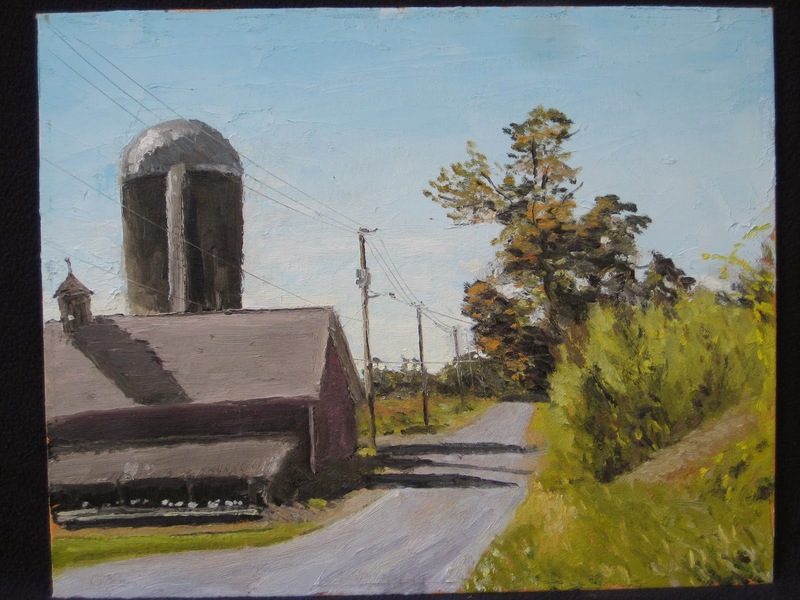 Matt Chinian Painting Blog: Oak Hill Road, Barn redone, seasons change, but some things stay the same. Oak Hill Road, Barn redone, seasons change, but some things stay the same. 19 F Sun to haze. I got started at about 1:30, I went pretty much strait to this spot, which I had painted in October, I had to get away from the river! I started with the dark, I wanted a scene with some contrasts and with the countryside covered in snow, lots of the big scenes look washed out. Sky, done in two temps. The snow on the barn roof was elusive, when you're looking at it in comparison to the sky, it looks dark, when you compare it to the shadowed barn it looks light, so what to do? I kept trying different tones, Until one looked right, even thought I modulated a bit here and there. I'm looking South West, mostly West, I think, and the sun is moving, the sky is getting warmer, and the roof, darker. This is exactly what happened the last time I was here, even though there was no snow. My focus on today's work was trying to get my tones to right, I spent 1 hour, 40 minutes, ( I should have gotten there earlier!) I sacrificed detail. The road, if you notice is largely the bare tone. Here is my scene at the start, the ligt raking over the roof. As the session progressed the sky turned a bit hazy, I actually liked it. It made the scene warmer, and hardly any darker. Thank you for showing the October painting again: it is quite interesting to compare! Well done! Thanks Chani, It was surprising for myself to see it again, and painting it in such different seasons but with a similar lighting theatrics at play, it was almost surreal. Excellent work. I can see why you had trouble with the barn roof, but I think you got it about right in the end. Great work Matt. The seasonal variations are reminiscent of Monet and his haystack paintings. Thanks Nate, Monet was one of my hero's early on, I grew up near Boston and the Museum of Fine Arts has a great collection of Monet.